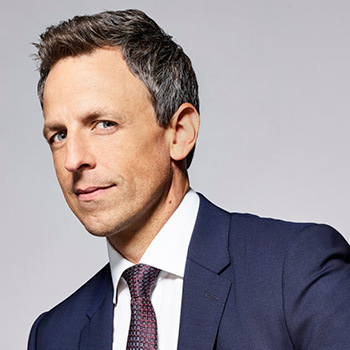 Seth Meyers is an Emmy Award-winning writer and current host of Late Night with Seth Meyers. Meyers began his TV career with Saturday Night Live in 2001, where he was a cast member for 13 seasons. Meyers served as head writer for nine seasons and “Weekend Update” anchor for eight. In 2011, Meyers won the Emmy for Outstanding Original Music and Lyrics for host Justin Timberlake’s musical monologue. In all, Meyers has garnered 20 Emmy nominations for his work in television. Meyers currently executive produces the NBC comedy A.P. Bio and also executive produced and lent his voice to Hulu’s animated superhero show The Awesomes, which ran for three seasons. In addition, Meyers has joined forces with SNL alums Fred Armisen and Bill Hader to create IFC’s Emmy-nominated docu-parody series Documentary Now!